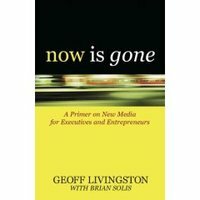 I got a chance to sit down with Future Works and Bub.blico.us founder and PR 2.0 blogger Brian Solis to chat about the book that he assisted Geoff Livingston in authoring - Now Is Gone . The book which retails for only $10 on Amazon.com (less than you spend on lattes in a week) is positioned to be a good primer for anyone that is thinking about the new media landscape from big companies to entrepreneurs. The book Now Is Gone offers insight for anyone trying to better understand the ever changing social media space and has extended itself online with the Now Is Gone blog to continue the conversation. Thank you to Brian Solis for taking the time to chat with me on a video interview (shown below) on a Saturday and his birthday from Silicon Valley, California. We had some delay issues with the audio and video but we rolled through it as Brian offered some compelling insight about leveraging social media because ... Now Is Gone! Book Review Note: Do you have a new book you think I might like to review? Email me the details.